Bone broth – whether it be fowl, fish or meat – has long been a staple of the human diet. Homemade broths have fallen in popularity due to the ease of purchasing store-bought stocks. 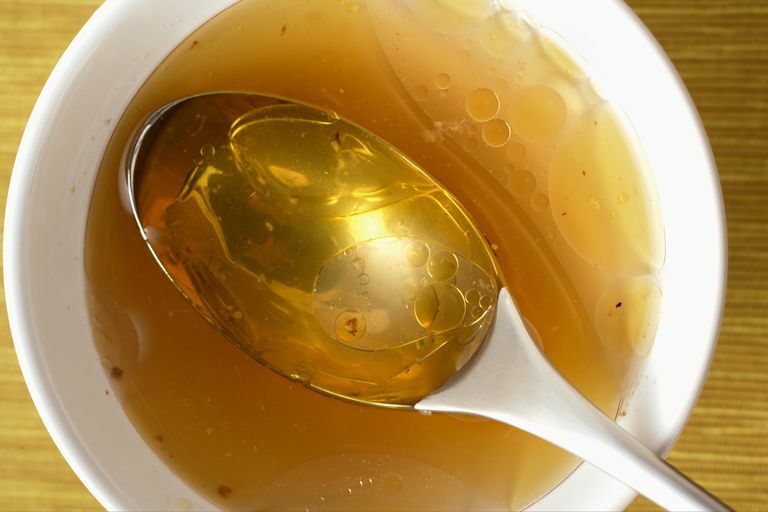 However, the use of bone broth as a healing agent, particularly in the area of gut health (with its connection to other chronic health problems), has been gaining in popularity. Bone broth is created by cooking meat or fish in water, typically with vegetables, for an extended period of time. Cooking times may range from as little as 3 hours to as much as 72 hours. Bone broth advocates recommend homemade bone broth, not store-bought. It is thought that the processing of store-bought broths strips the broth of its healing properties. In addition, there are concerns about some of the ingredients found in store-bought broths. Researchers have begun to identify a connection between gut health and the rising rates of some of the chronic health conditions of our day. Naturally, this research suggests a need to improve the health of the gut, e.g. the balance of the gut bacteria and the integrity of the intestinal lining, in order to reduce unwanted symptoms. As part of this effort, attention has been brought to the notion that bone broth may be quite beneficial to the health of our intestines and therefore our overall health. The Paleo diet is based on eating in a way that is assumed that our hunter-gatherer ancestors did. The diet emphasizes the importance of eating fruits, vegetables, meat, and nuts while excluding dairy, grains, and legumes. Bone broth is seen as a natural fit for such a diet. The most obvious connection between bone broth and health is that of chicken soup's long association as being a helpful remedy for upper respiratory infections. According to the GAPS website, "Meat and fish stocks provide building blocks for the rapidly growing cells of the gut lining and they have a soothing effect on any areas of inflammation in the gut." According to the Weston A. Price website, "Stock contains minerals in a form the body can absorb easily – not just calcium but also magnesium, phosphorus, silicon, sulfur, and trace minerals. It contains the broken down material from cartilage and tendons – stuff like chondroitin sulfates and glucosamine, now sold as expensive supplements for arthritis and joint pain." As is typical with food-based approaches to healing, not much clinical research has been conducted. This is due in large part to a lack of funding, but also due to the difficulty in controlling for the many varying factors involved in assessing the effect that a certain food could have on an individual. A study published in Chest Journal conducted an evaluation to see what components of chicken soup, if any, could be the reason behind chicken soup's reputation for helping colds and other upper respiratory infections. The researchers found that certain components of the soup appear to provide anti-inflammatory effects. Interestingly, while the broth of the vegetables when tested alone appeared to have some toxic elements, these elements were not present in the broth when chicken was added. The researchers conclude that the synergy of all of the ingredients is necessary for its health benefits. Another study brings up a point of concern regarding bone broth. This study, published in Medical Hypotheses, took a look at lead content within bone broth. When animals and humans are exposed to excessive levels of lead, it can be stored in their bones. These researchers found that the chicken bone broth that they tested had higher lead concentration levels than that found in tap water. Lead concentrations were lower when the broth was made with just chicken meat, without any bones, cartilage or skin. The concern here is that excessive lead consumption has been linked to many significant health problems. Chris Kresser, an alternative health writer, points out that the lead levels in the Medical Hypothesis study still fell below those of the EPA recommended limits per day. He maintains that the high level of nutrients consumed by those on GAPs and Paleo diets may provide protection from any higher levels of lead found in bone broths. With so little clinical research to go on, it is hard to come to any firm conclusions as to the health benefits of bone broth. On the other hand, it is hard to discount the thought that a substance that has been a major factor in cuisines around the world for centuries might have some health benefits. Maybe future research will provide solid evidence that the vitamins, minerals, amino acids, etc., found in bone broth, may be just what our guts (and the microflora within), need to function optimally. But without strong scientific data, as of now, this is just a theory. We can conclude that it is delicious and soothing and that it is accepted as "healthy" in many cultures. In the meantime, if you decide that consuming bone broth on a regular basis is the right choice for you, you may want to choose to eat truly free-range chicken and pasture-raised beef. Much of the factory-farmed livestock that is sold in our supermarkets have been raised under sub-optimal conditions, with sub-optimal diets. Eating animals that have been raised in optimal environments may reduce your exposure to toxic elements. Also, given the concerns about lead, if you consume beef broth regularly, speak with your doctor to see if they think that it is necessary to test the lead levels within your blood. "Gut and Psychology Syndrome Introduction Diet." Monro, J., Leon, R. & Puri, B. "The risk of lead contamination in bone broth diets" Medical Hypotheses 2013 80:389–390. Morell, S. "Broth is Beautiful" The Weston A. Price Foundation. Rennard, et.al. "Chicken Soup Inhibits Neutrophil Chemotaxis In Vitro*" Chest Journal 2000 118:1150-1157. Kresser, C. "Bone Broth and Lead Toxicity: Should You Be Concerned?" Chris Kresser.